In-Depth: Payments Wearables Market Enters New Phase as Passive Devices Get Tokenized Bank Cards | NFC Times – Near Field Communication and all contactless technology. Switzerland-based Swatch plans to expand its SwatchPAY! service in Europe and beyond. The service features budget-priced analog watches that can be provisioned with tokenized payments cards after the sale. Already in China, SwatchPAY! is expected to launch in other European countries and perhaps even in North America or elsewhere in Asia-Pacific this year, NFC Times has learned. That follows its launch in Switzerland this month. What sets SwatchPAY! apart from such payments wearables services as Fitbit Pay and Garmin Pay–as well as Apple Pay and Google Pay used on smartwatches–is that SwatchPAY! is available on much cheaper analog watches that users can have provisioned with a tokenized EMV payment card after they buy the watches. And unlike smartwatches, users don’t have to worry about recharging the watch batteries every night. Although the analog watches and other passive wearables can only be loaded with one bank payment card, practically speaking, this opens up a potentially new market for payment wearables, especially for sub-$100 analog watches, which could be provisioned right in the store after consumers buy them. 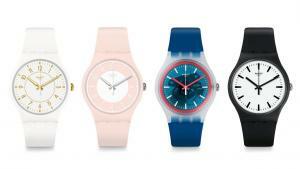 Swatch has introduced four watches for its payments service so far, each priced at CHF85 (US$85.70). Article has about 2550 words.